Inkjet printers with built-in continuous ink supply system (CISS) has long ceased to be something unusual. Such models are now almost each manufacturer. 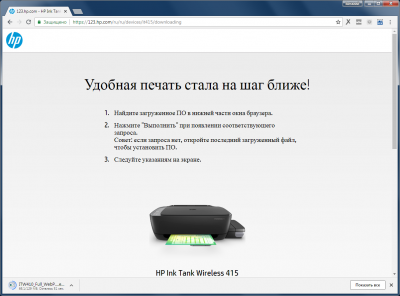 Recently, HP introduced a new line of similar printers HP Ink Tank. Their main peculiarity lies in the original design of the module CISS to get rid of fear to get paint on your hand and all that is around. The print quality, according to the manufacturer, the new range of best-in-class. Well, let’s see whether this statement is true. 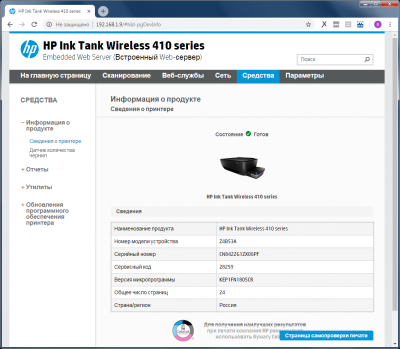 Watch will for example, MFP HP Ink Tank Wireless 415 – one of the three printing devices, having wireless connectivity to a desktop and to mobile devices. The printer comes in a cardboard box with color printing, where there are convenient handles for transportation. The box is light enough so that it without difficulty can be worn alone, even at quite large distances. 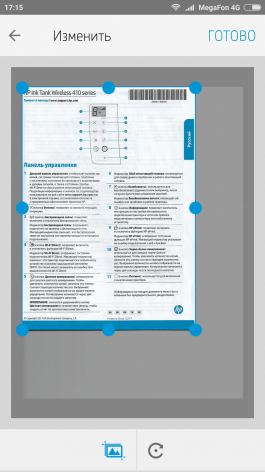 a set of printed materials, including a brief user manual in Russian and other languages. A more complete printer think hard. There are the interface cable and a full (not starter) ink set, and even package in case of relocation with the printer, for example, from home to cottage or office. As for ink, it is worth noting two huge bottles of black ink with a volume of 170 ml each – a generous gift from the manufacturer, which can last for extremely long term work. The range of printers Ink Tank presented today five models, differing in the presence or absence of Wi-Fi module, as well as color solutions. 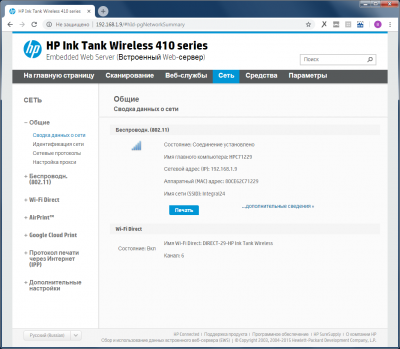 So, MFP HP Ink Tank 315 does not have a Wi-Fi module, and the model Ink Tank HP Wireless 415, which came to us for testing. HP Ink Tank 319 and 419 HP Ink Tank differs from the above only in color case blue insert at the top. Well and the third printer, HP Ink Tank 115 is not a MFP, and a printer with the same two older brothers technical characteristics, but not having Wi-Fi module and scanner. If the last function you do not need, it is worth a closer look to this model. The main difference all three new models from other HP devices and other manufacturers is the presence of built-in CISS system. The rest is the same four-color inkjet printers, as well as some other models that use the ink of three primary colors for color printing and black for monochrome. Note that color ink for HP Ink Tank used water-soluble, while the black pigment. The printheads in the device are replaced separately. Unfortunately, the manufacturer doesn’t provide information on resource heads and know their value also failed due to the fact that at the time of this writing, they were absent. The total load on the MFP according to the manufacturer’s recommendations shall not exceed 1,000 pages per month, and the average should be within the range from 400 to 800 pages per month. The figure clearly alludes to actively print home users. If you stick to the load, one filling of ink you will last for a few months. Ink for HP Ink Tank is delivered in separate bottles patented design: color-70 ml, black — 135 ml According to the manufacturer of set of color ink is sufficient to print 8,000 pages A4 with a five-percentage filling by the method of ISO. But two bottles of black ink with a capacity of 170 ml each included in the standard package should be sufficient for printing in a similar way 15 000 monochrome pages. New from HP is made of matte black plastic with lacquered inserts in the top. The device is very lightweight and compact, but because of the relatively long length of multifunction printer will require some space on the table. This option is due to the protruding side of the module CISS with ink tanks. This location of the module makes it easy to reach the filler, and performing routine refueling as carefully as possible. Also note the almost complete lack of hull design sharp corners or edges. The only exception is the upper edge. The case in this place as if it was cut, leaving a completely flat upper horizontal surface of the scanner lid. However, a typical external features of the MFP taken from different models of HP printers of yesteryear. Structural elements that support the paper is completely retracted inside the case. The rear mounted fold the tray falls down and does not protrude beyond the external dimensions, and folding the tab of the feeder retracts into the hull. So the outside is only the module CISS, flat surface of the cover which constantly want something to occupy office facilities, a photo or any more details. The design of the module CISS manufacturer in the development paid special attention. Apparently, the objective in the design was placed in such a way to get a result such a system fill ink that is substantially superior in convenience and ease of maintenance of any CISS — homemade or third-party manufacturers. And it was a success. A module is a container with four containers having transparent walls with marks for accurate monitoring of the filling. Each tank top features a neckline special design, closed with a rubber stopper. Well, on top of the whole container is closed with a flip-up cover without a lock. The front and side faces of the case are devoid of any interfaces. Only on the back wall there is a connector to connect the power cable and (if necessary) USB interface cable. As with most other models the power supply of multifunction printer disposed within the housing. 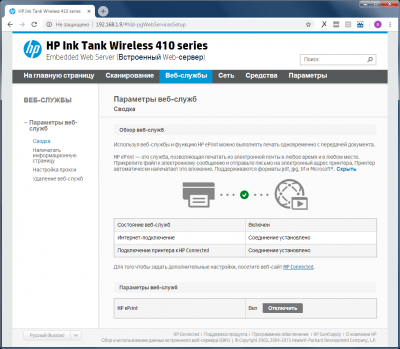 Additional keys power management from the Ink Tank HP Wireless 415 is also no. To enable or disable the multifunction printer has only one button located in the common control unit, located on the left of the scanner cover. There was a place for a small character LCD display and nine round mechanical buttons with a very short throw and led light, made in the form of tiny points of light. The principle of feeder and paper path inside the printer is traditional for this type of device. Paper is loaded vertically in a tray located at the rear wall of the housing. Pre-need to remove a supporting wall, pull up on the rear edge of the housing. The flap locks in end position automatically. Next, you need to install on the desired width of paper plastic Adjuster and put the tongue of the receiving tray. The latter is made thin enough, but turned out to be able to keep the declared 25 sheets of A4 paper and normal density. Interestingly, while the input tray is designed for a significantly larger amount of sheets 60. The scanning module, as already noted, the Ink Tank HP Wireless 415 traditionally placed on top. It is a glass table A4-fitting lid. Having dealt with the appearance of new items, take a look inside. To access the compartment printheads need to open the decorative front panel of the chassis, and then another, and the inner door. That’s it and there is the whole printing mechanism. There you can see the tube of ink, suitable for the top of the head block. Install the latest is not difficult. First, the location of this block does not force the user to do some complicated movements while mounting or Dismounting, and secondly, to make a mistake when setting virtually impossible – markings and colors placards simply will not allow this to be done. In General, the novelty looks, though a bit gloomy, but attractive, and from the point of view of usability it is generally all done almost perfectly. Connecting HP Wireless Ink Tank 415 to the computer will not take much time. In principle, it is possible to do without a computer. 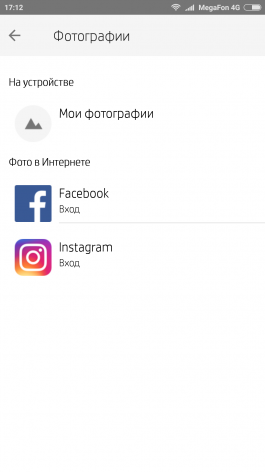 If you plan to print photos and documents from mobile devices, then for Android OS and iOS only need to download and install a branded app from their respective software services. When connected to PC also is not required to use the CD-ROM supplied. The whole process of selection and installation is necessary FOR conveniently organized through the home page on the website of the manufacturer. But before you install the driver, the MFP needs to supply the printheads and refill the ink. For the first time on this operation and to read the detailed manual with pictures, it will take some time, and later refueling would take the user a couple of minutes – no more than required time to replace the cartridges in the printer without CISS. When you install printheads should special attention be paid to the design of this part of MFP. Head blocks blue plastic cover with a spring-loaded lock that serves as a host to the ink supply. Themselves head after installation, the manufacturer is strictly prohibited to remove and re-install, but to open the cover from the hub of the ink supply you need whenever you are going to transport MFPs for the long haul. Already filled to capacity with ink afraid of anything when you flip the device will not happen, but when the cover is closed in the head can get air from the ink paths, and they will fail. Therefore, when transporting the ink supply unit must be disconnected from the printhead. It is worth paying special attention. Now it remains only to fill the IFIs. HP has its own patented technology for refilling, after which the user is guaranteed to remain with clean hands. Don’t even need napkins, for any CISS third party just nonsense. All the matter in the special design of the filling openings MFP and covers-neprolivajku on the bottle of ink. The ink is slowly poured from a bottle into a receptacle only when these two elements are tightly connected to each other. It is impossible to pull a bottle neck, as the ink ceases to flow. The dirty that while the user may see is a tiny ink spot on the cut cap from the bottle, appearing at the very very sloppy quick refueling. Tanks for color inks in the Ink Tank HP Wireless 415 with a capacity of 70 ml, and the capacity for black – 80 ml. the bottle of black ink, unlike colored with more than one gas station. It is encouraging that each bottle is sold separately at the listed price 690 rubles each, but they are easy to find and cheaper. Bottles have a patented system to fill ink, preventing the leakage them out even if turned upside-down with the lid open, how old the ink. To pay much attention ON brand to work with MFP to the PC is not much point. We have been informed, and any special settings in this case. We only note that in the standard installation package also includes “Helper for configuring and working with MFP” and additional HP Photo Creation intended for quick editing and printing photos. 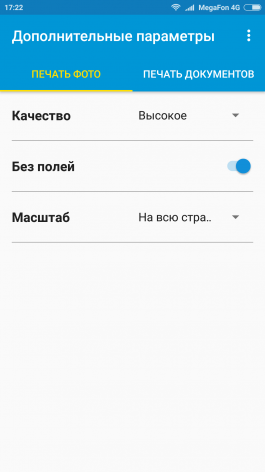 Mate has a Russian interface, from the menu which you can quickly get to the pages with the settings of the printer, open the task Manager and run a small application for scanning. Also the “Assistant” allows you to learn all the necessary information about the genuine supplies and get help over the Internet. Print settings include the ability to change network settings, paper type, and print quality. Well, with the help of built-in services can diagnose problems and improve print quality if necessary, using cleaning the heads, cleaning the printer and the function of alignment. There is also a built-in application for scanning, the pages of which the user can carry out any settings. Note that to configure the MFP to use the built-in web interface. Through it has all the same functionality as using a “Helper”. 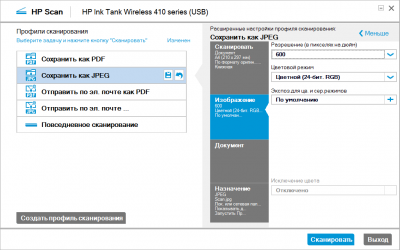 But many users probably will work with the MFP via mobile devices, it’s one of the major differences between HP Ink Tank Wireless 415 from other printing devices in the lineup is the presence of a wireless module Wi-Fi. 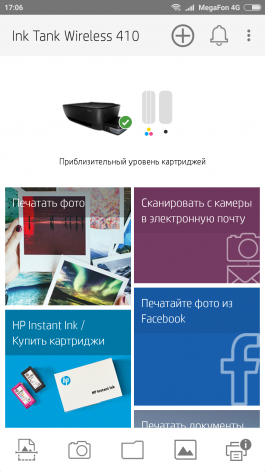 To print from mobile devices from Google Play or App Store, you first need to download and install the free app HP Smart. This program allows you to configure your MFP, manage, scan, print, and send files to other users. 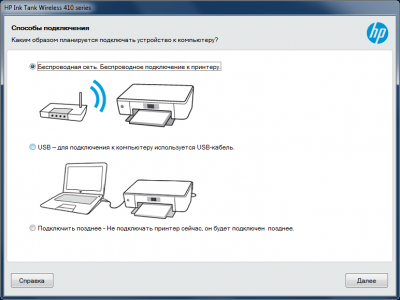 To work with the device smartphone or tablet can be connected to the router (if the multifunction printer is also connected) or directly to a recording apparatus using the Wi-Fi Direct. From the settings app, and printing or scanning is unlikely that someone will have trouble. User-friendly interface with modern design and large buttons immediately prompts the user to continue the desired action. 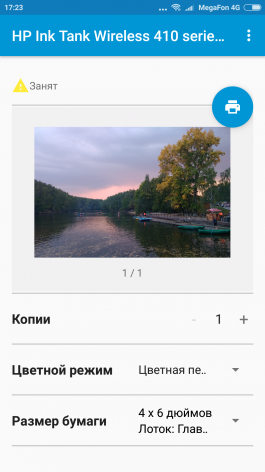 For printing photos and documents from mobile devices under Android OS, you will also need to install a software module, but this is done in automatic mode. The user need only confirm the procedure of downloading and unpacking. For users of Apple technology to install additional modules will be required. Print settings are few, but the quality and type of paper you can ask. 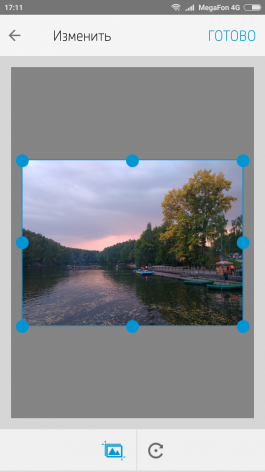 It is also possible to quickly carry out cropping, which is especially important for fans of the mobile photo. File print not only directly from phone, from email, cloud services iCloud, Google Drive or Dropbox, social networking, Facebook or Instagram, as well as of the FTP servers. 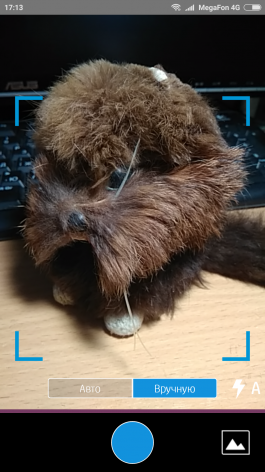 You can send the file and print directly from the camera. For each of the printing options provided a brief overview. 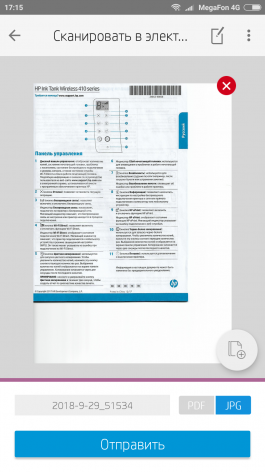 Also just using HP Smart document scanning. Settings in this case also few, but they are sufficient for producing high-quality electronic copies of the document. Settings page MFP in HP Smart sends user to the web interface. In General, the application HP Smart allows you to use almost all the resources of the IFIs, Cycling is not for this desktop.